More air + more fuel = more power. 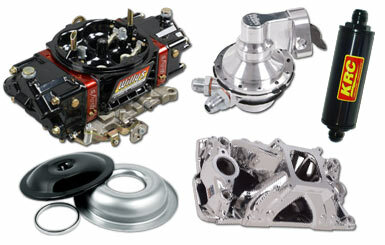 Find more of everything at Summit Racing with our huge inventory of air and fuel delivery parts and accessories. Breathe in greater amounts of power-building airflow with our selection of air cleaners, carburetors, and intake manifolds. Feed your thirsty engine additional fuel with fuel pumps, fuel regulators, fuel filters, fuel injection systems, and other fuel systems components. And lock up more victories with the proven performance of industry-leading brands—Holley, Edelbrock, Outerwears, Willys Carburetor and Dyno Shop, Russell, Quick Fuel, and more. Shop and win with air/fuel delivery parts from Summit Racing!